Buckeye Local softball has rough day at St. C.
ST. CLAIRSVILLE — Buckeye Local has battled a veritable who’s who in OVAC Big School softball the last few games, facing off against the likes of Harrison Central, Indian Creek and Martins Ferry. 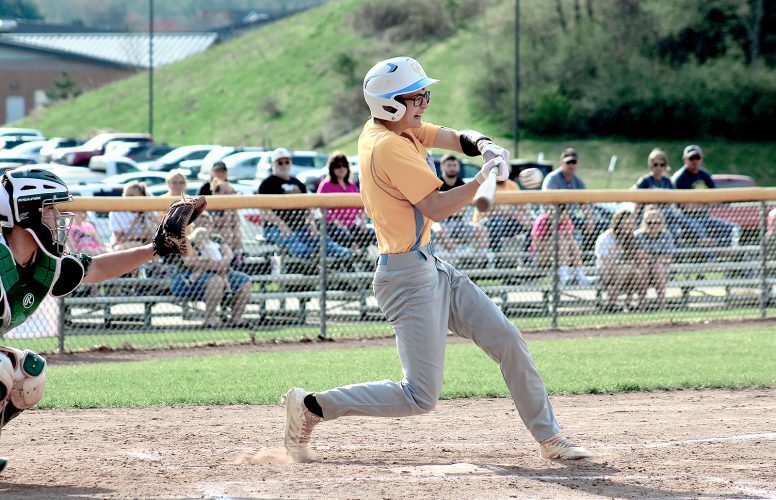 The Panthers capped the strenuous stretch with a doubleheader against St. Clairsville. But, while head coach Drew Case’s team remained competitive against its previous opponents, Buckeye was not ready for what awaited it on the North Market Street diamond. The Red Devils capped a solid week with an offensive explosion responsible for 40 runs and 42 hits in 18-0 and 22-1 victories Saturday afternoon. Buckeye used two pitchers Saturday, both of whom were fairly accurate and threw strikes. The problem was the Red Devils were hitting — all of them. Every batter that stepped to the plate, from the starting nine to the three girls that saw action off the bench, got at least one hit between the two games. Many reached first safely on multiple occasions. The first inning of Game 1 saw St. C. display a little patience at the plate, looking to get a good read on Buckeye lefty Kya Demeter, working deep into the pitch count. That resulted in five runs on five hits, as the home team hit through the lineup. For head coach Rob Gallentine, it was nice to the entire spectrum of his lineup to get into the act. “It was nice to see everyone hit. We can’t rely solely on the top of our order,” said Gallentine, a stance he iterated earlier this week in a win against Monroe Central. The second game was more of the same. The Devils again posted a five-spot in the first inning before Buckeye pitcher MaKayla Meeks gave her team a brief moment of respite, limiting the damage to one run in the second. Up 6-0 after 2.5 innings, St. C. put a final, emphatic stamp on the afternoon, driving in 13 runs on 12 hits in a third inning that saw 17 batters come to the plate. All batters, 1-9, score at least once. The usual suspects led the way for the home team, as cleanup hitter Dekotah Namack drove in five runs with three singles and a double across two games. Fellow frosh Hannah Thoburn drove in three runs, with five singles from her No. 2 spot, while making more than a few sterling catches on the move in center. Bree Bennington drove in four runs, with four singles and a double. Leadoff hitter Taylor Gallentine drove in two, with four singles and a double, scoring five runs in the process. Starting pitcher and No. 6 hitter Jenna Jaskowiak drove in four runs, with five singles and a double. She pitched five innings of shutout ball, fanning four and walking one. No. 7 hitter Paris Stachyra was just as effective, tying for the team-high with five RBIs on three singles and a double. Alexis Hines was the third Devils’ hitter to drive in five runs, hers coming via two doubles and a pair of singles. Katie Miller, who bats out of the No. 9 spot, drove in three runs with a trio of singles. The Red Devils will need that to continue, as they push to get back into the OVAC Class 4A race. St. C. started the week 5-3 and in the sixth spot in a crowded battle for one of the coveted top four spots. Next up for the Devils is a home contest against powerful John Marshall on Tuesday. Buckeye (2-10), which received an RBI single from Kodie Richardson in the second game, hosts Edison on Monday. Camryn Case legged out two singles in the first game. BUCKEYE LOCAL: Demeter (lp, 1K, 2BB) and Spencer. Case 2S. ST. CLAIRSVILLE: Jaskowiak (wp, 1K, 1BB), Gallentine (3) (4K, 0BB) and Namack. Gallentine 2S, D; Thoburn 2S; Bennington 2S, D, 2rbi; Namack 2S, D, 4rbi; Jaskowiak 3S; Stachyra 2S, 2rbi; Hines 2D, S, 4rbi; Miller 2S, 2rbi. BUCKEYE LOCAL: Meeks (lp, 1K, 5BB) and Spencer. Richardson S, rbi. ST. CLAIRSVILLE: Jaskowiak (wp, 3K, 0BB), Gallentine (4) (1SO, 0W) and Namack, Stachyra (4). Gallentine 2S, 2rbi; Thoburn 3S, 3rbi; Bennington 2S, 2rbi; Namack S, rbi; Toothman 2S, 2rbi; White D; Jaskowiak 2S, D, 4rbi; Stachyra S, D, 3rbi; Hines S, rbi; Miller S, rbi.